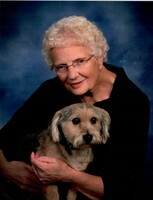 Provide comfort for the family of Gladys Hetrick with a meaningful gesture of sympathy. Gladys L. Hetrick, age 88, of Brookville PA, passed away peacefully on Monday, February 11, 2019, at McKinley Heath Center in Brookville, PA. Born in Coolspring, PA, on March 16, 1930, she was the daughter of the late Albert Hetrick and Lula (Himes) (Hetrick) Byerly. On April 24, 1948, she married the love of her life, Samuel E. Hetrick at the Methodist Parsonage in Stanton, PA. He preceded her in death. She was a Brookville High School graduate. While she was in high school, she learned to knit mittens and dish cloths. She was also a very accomplished seamstress, sewing most of her daughter Janice’s dresses and clothes when she was a child. Gladys was a wonderful cook and known for her family meals that she prepared, apple sauce, homemade bread, cinnamon rolls and wacky cake. Gladys always had an open heart and was willing to help others. She was an active Charter member of the Calvary Church of the Nazarene. As a stay at home wife and mother, she wove rugs and was known as a fabulous babysitter to anyone in need. Once her daughter was in high school, Gladys went to work at Byerly Tire in Brookville, PA. The company was owned and operated by her brother, James Hetrick, she stayed with him until she retired. Gladys and Samuel were the caretakers at the Ohl Cemetery for many years and she also served as the secretary with the Ohl Cemetery Association. Family and friends will be received on Friday, February 15, 2019, from 2 – 4pm and 6 – 8pm, at McKinney – d’Argy Funeral Home, ltd, 345 Main Street, Brookville, PA, 15825. A funeral service will take place on Saturday, February 16, 2019, also at the funeral home, beginning at 11:00am and officiated by Pastor J. Ray Baker. Interment will take place at the Ohl Cemetery, Beaver Township, Jefferson Co., PA. Memorial contributions may be made to Ohl Cemetery or WRC In Home Solutions Hospice. Online condolences and other information may be found at www.mckinneydargy.com. To plant a memorial tree in honor of Gladys L. Hetrick, please visit our Heartfelt Sympathies Store.